Superhero fans can see a different kind of hero onstage at Ovalhouse this June with Oladipo Agboluaje’s The Croydon Avengers. Presented to coincide with Refugee Week, The Croydon Avengers blends comic book visuals with martial arts to tell the story of a trio of masked vigilantes just trying to make their community better – and the media mogul who sees these refugee superheroes as a threat to British identity. Ahead of the play’s Ovalhouse debut, director Suzanne Gorman tells us about bringing this action-packed piece to life in this guest blog. 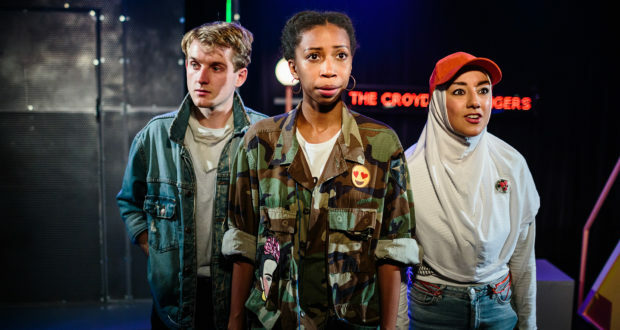 The Croydon Avengers by Oladipo Agboluaje is a celebration of diversity and Black, Asian, Minority Ethnic and Refugee artistry – so I’m currently reflecting on the fact that I have a pumped-up Billionaire White American man to thank for the inspiration for this play. Not Donald Trump (although our writer has called the media mogul in the play Regina Rump) but the one and only Bruce Wayne, AKA Batman! It was whilst I was watching a Batman film many moons ago that I was struck by the lack of superhero role models for young people from BAMER backgrounds – and wanted to do something about it. 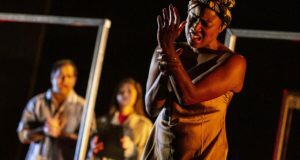 As a one-woman operation running the small theatre company Maya Productions, it’s taken a journey involving hundreds of people to see this idea grow from a concept to a full theatre production lighting up the stage in London and Harrogate. The play was inspired by young refugees and Londoners who took part in our Superheroes:South of the River Project in 2015, which used martial arts, comic book storytelling and theatre to explore role models and superheroes. I really wanted to capture the wonderful spirit and energy of the young people we met. They immediately challenged perceptions of refugees being helpless and needy. At Maya Productions we look for stories that don’t often get told, and in The Croydon Avengers we have crime fighting, superpowered refugees being pursued by an Anglo-Indian media mogul who’s fanatical about British values. The world of the play, which is set in a fictional U.K., would be totally absurd – except for the fact that over the writing period, the real world has changed so dramatically. Questions of race, identity and belonging in British society mean very different things now than they did three years ago; the recent Windrush scandal, for instance, shows how vulnerable people can be in our British society. The Croydon Avengers asks us to think about what we mean when we talk about British identity, and how that relates to living in a contemporary multicultural society. It does this, however, through humour and a fast-paced, action-packed script. Creating an exciting, fun, yet thought provoking experience for the audience is at the core of this production, and we have developed this by continuing our cross-art form collaborations. The production draws its inspiration from both comic books and contemporary superhero films. 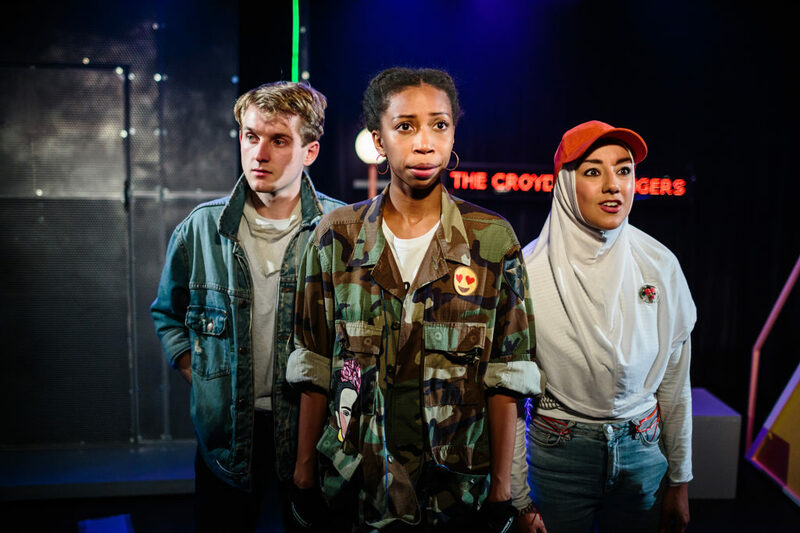 Our teenage superheroes have a backdrop that is almost cinematic in scope, making it easily accessible for young people who may watch lots of films but don’t often come to the theatre. Video projections created by Victor Rios add to that visual language. As our heroes are branded terrorists, the show invites us to look at how viewing the world through our screens can leave us open to manipulation and distortion. We invite the audience into this world too; they can film parts of the show with their phones and choose to be journalists, questioning the powerful Regina Rump about her pursuit of our heroes. No superhero play would be complete without powers and a few fights, so a strong physical language is key to our storytelling in the play. For this, we used the combined talents of martial arts expert Alton Brown and movement director Diane-Alison Mitchell, who have created something unique for the play. I really want theatre experiences to be able to extend beyond the moment of the show itself, and so we have an online comic that shares the backgrounds of our characters. We’ve also worked with Why Comics? to create resources for teachers to use alongside the play. The Croydon Avengers will play at Ovalhouse from 19-23 June.